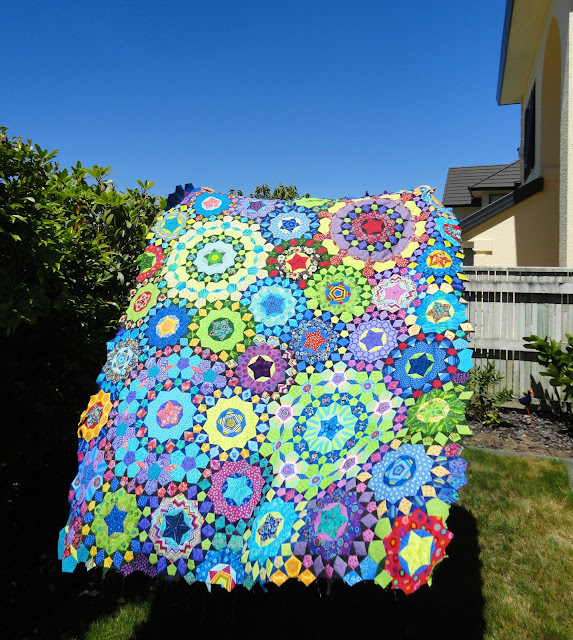 This page is all about my la passacaglia quilt. Some very kind bloggers helped me out when I was considering making this quilt, so I'm putting some details here in case other people are interested in how I made my quilt. I started my la passacaglia on 1 January 2015, with these fabrics. 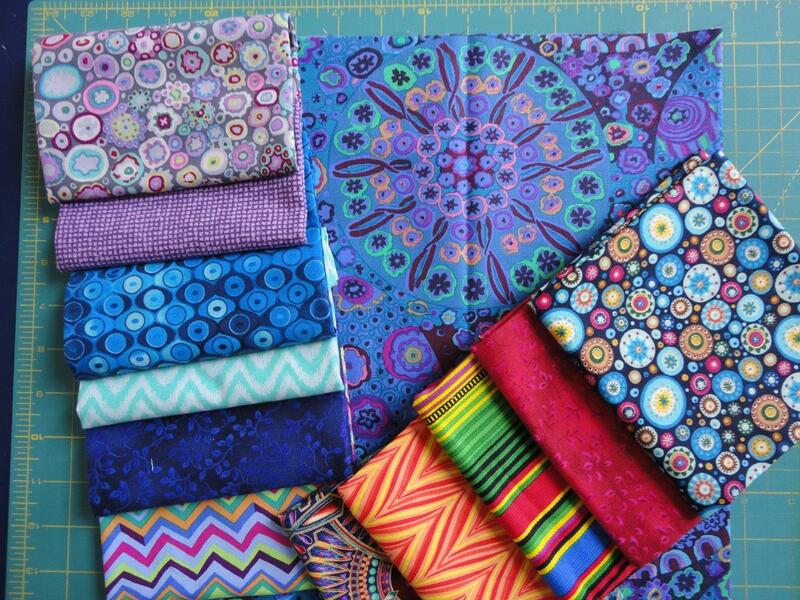 I wanted my quilt to look like the piece of Kaffe Fassett's Millefiori fabric in the photo below (top right). I think it's important to have an overall look in mind before you start. Otherwise you could just end up with a big mish mash. That's fine if you want that, but many people don't. Like many other people, I used the English Paper Piecing (EPP) method. I know Willyne hand stitched the original quilt when she designed the pattern, but I had no experience with hand stitching, so opted for EPP. I also think in my case the EPP would provide a stronger seam. I'd hate to do all that work and then have it fall apart! I chose acrylic templates with 1/4" seam allowance, and they are fine for me. I strongly recommend acrylic templates for this quilt. They are especially useful if you intend to do fussy cutting. I use glue basting, and Invisafil thread by WonderFil, in two shades of grey. Invisifil thread was recommended to me, and it has been great. It is very fine at 100wt, but also extremely strong. It never breaks! I could have pieced my whole quilt with one reel of this thread. There is so much on each reel. December 2015 - what to do with the edges? September 2016 - it's finished! I finished hand piecing the top on 14 January 2016, one year and two weeks after starting. I then added borders, and hand quilted it with Aurifil 28wt, in a range of colours. I matched the thread to the fabrics as much as possible because I didn't want to add even more busyness to the quilt. I intend to hang it on the wall once it is finished. basted, but not quilted yet. And below is my mum's la passacaglia quilt. She also used English Paper Piecing and hand quilted her quilt. Mum started her quilt after she saw what I was doing - she caught the bug too. What was going to be a pillow, turned into a whole quilt. In 2016 QuiltMania magazine chose mum's quilt to hang in their exhibition of 20 la passacaglia quilts at the International Quilt Festival in Houston. Now they've also chosen it to hang in Pour l'amour du Fil in Nantes, France in April 2017. Well done mum - Joy Hill. I'm so proud of her. 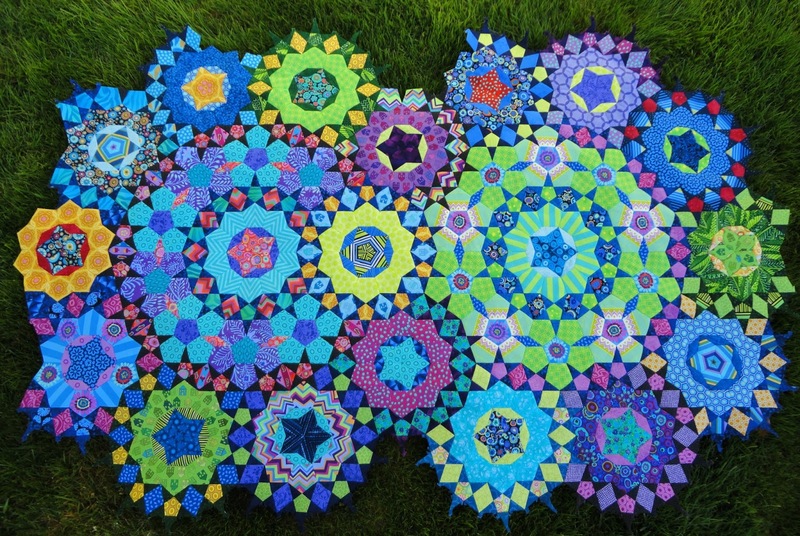 I heard your interview on Charlotte's Slightly Mad Quilt Lady podcast and just HAD to see your work. It is breath taking! Thank you so much for sharing! This is amazing! Very beautiful! I can not imagine making something like this so I am very impressed. Thanks for sharing it with us. What an inspiring quilt. Thank you for the time, patience, skill and creativity you poured into it. 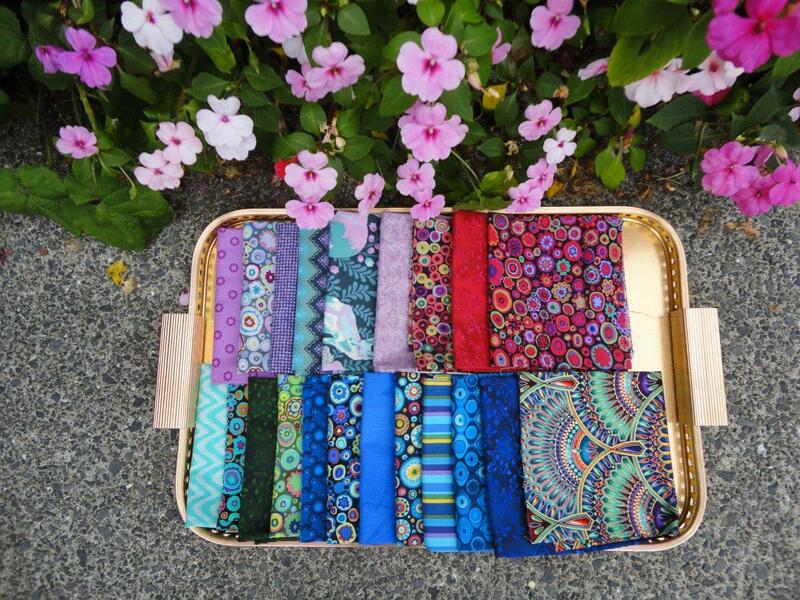 It looks like a labour of love and a true journey. So beautiful. 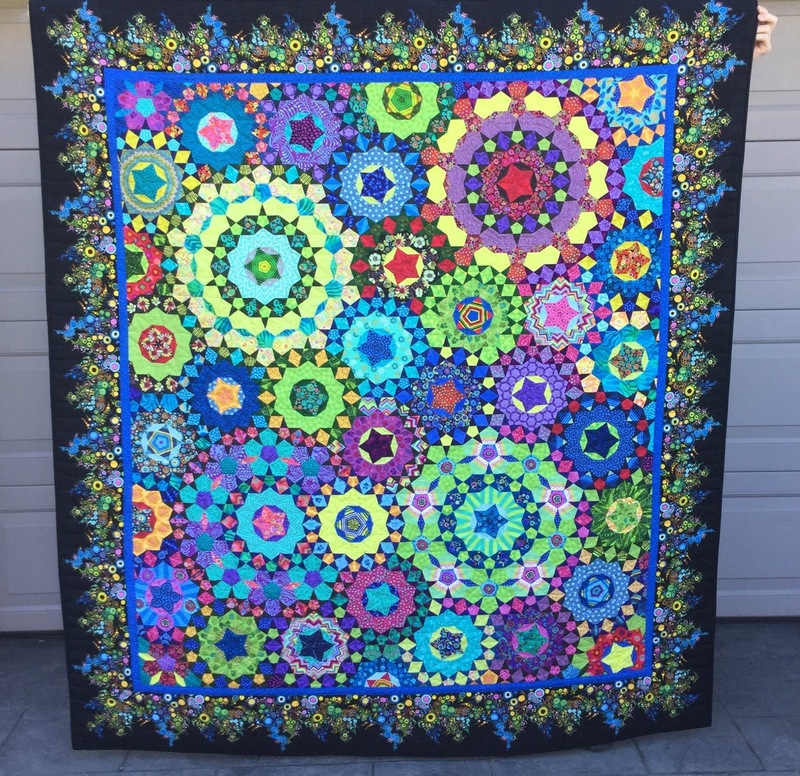 I see your beautiful color choices at the beginning of this post, but then I see so many more colors in your finished quilt. 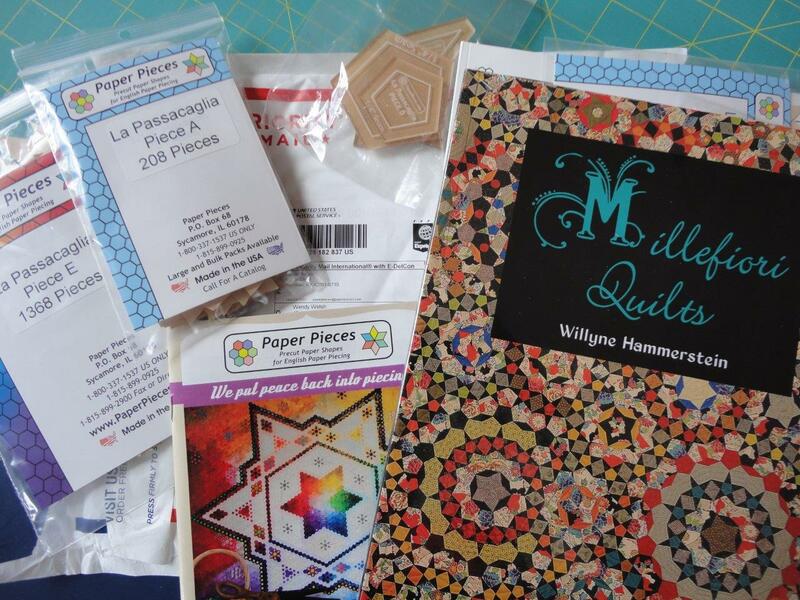 I get overwhelmed with trying to pick color choices, so I haven't started the quilt. I guess mine will be a mish mash. Your creation is absolutely amazing!!!!!! I'm sure you had the border fabric before you began so you could match things up. But, I'm just in awe how you finished the whole wonderful center off with that border fabric. It is absolutely beautiful and amazing!!!! It's so gorgeous! Thanks for sharing it with us! Beautiful. Love hearing the story of it's creation. I am so impressed. Your quilt is beautiful.